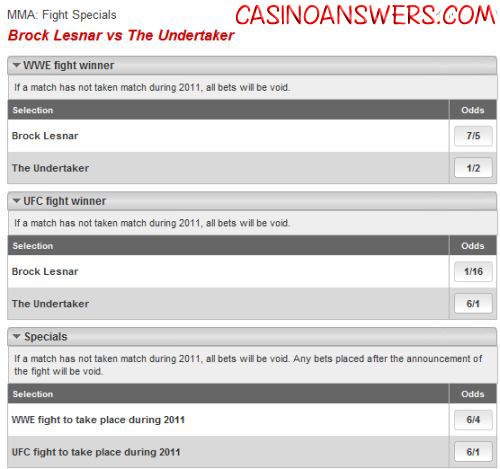 Bet on Brock Lesnar vs The Undertaker - Casino Answers! There was quite an interesting incident after UFC 121, involving former WWE superstar Brock Lesnar. Brock was beaten and was walking away, and walked past The Undertaker, of WWE fame. The Undertaker was being interviewed at the time, and stated to Brock Lesnar “Want to do it?”. Speculation is that Brock Lesnar was being challenged to a match against the Undertaker at Wrestlemania XXVII, which takes place on April 3, 2011. Did you know that you can bet on a Brock Lesnar vs Undertaker match? Because you can! Currently, the UK sportsbook Ladbrokes have lines available on the possibility of a Brock Lesnar vs Undertaker match, and actually allow you to bet for real money on Brock vs Undertaker. I should quickly note that Americans can not sign up or bet at Ladbrokes, however you should check out 5Dimes Sportsbook who often have WWE Betting. Okay, so what exactly can you bet on at Ladbrokes when it comes to Brock Lesnar vs the Undertaker? The first initial bet is Will Brock Lesnar vs Undertaker take place in 2011? You can bet that the event will happen in WWE at 6/4 odds, or that the fight will take place in UFC for 6/1 odds. Straight off the bat we see a very easy bet to make. There is absolutely no chance that Lesnar vs Undertaker will happen in UFC. Dana White just won’t let that crap happen in his home. Therefore a very easy bet is to bet that Lesnar vs Undertaker will happen in WWE. If the fight doesn’t happen at all, then you get your money back. So this is an incredibly safe bet, and easy money to make. Bet It Today. The next option is if Brock Lesnar fights The Undertaker in UFC, who will win? Well Lesnar is 1/16 and The Undertaker is 6/1. While Lesnar is the best bet at those odds, I advise skipping that bet. This fight just won’t happen in UFC period; and you’re basically locking your money up for no good reason. Now onto the more interesting one – Brock Lesnar vs The Undertaker WWE Betting. This one is actually a tough one to predict. The Undertaker has an unbeaten streak at Wrestlemania, so would he give it up for an MMA fighter who is making a one-shot appearance? In my opinion, the answer is yes. The Undertaker is a company man, and I can’t see Brock Lesnar coming to Wrestlemania unless he’s guaranteed the win. I just can’t see Dana White going for that. On the other hand, Vince McMahon knows how important it would be to get Brock Lesnar on a WWE show. Think back to Mike Tysons role on WWE. At no point was he made to look stupid. He always looked strong, got to mock Steve Austin and beat him in mind games over and over, then finished Wrestlemania with a KO punch on Shawn Michaels. There’s a way for Brock Lesnar to win against The Undertaker and not have the Undertaker come out of it looking bad. Therefore, I suggest you bet on Brock Lesnar to win the WWE fight. If the match doesn’t happen then you get your money back so it’s no risk. What was the incident with Brock and Undertaker at UFC? Can I bet on WWE matches? Can I bet on Brock Lesnar vs The Undertaker online?